Make Sure A Fun Halloween Is A Safe Halloween! Parents or responsible adults should accompany children at all times – no child or group of children should ever go trick or treating alone. Walk only on sidewalks, and obey all pedestrian and traffic laws – careless drivers represent the major threats for little ones. Make flashlights available to both the children and the accompanying adults, and choose brightly colored costumes and/or reflective patches to increase visibility. Warn children not to consume any treats while trick-or-treating; tell them to wait until they have been taken home and inspected by parents or adults in charge. Fenstersheib Law Group, P.A., wish you and your little ones a very happy and very safe Halloween. And if you have any current legal issues that may be bewitching you and on which you want to get an expert opinion, please contact our experienced attorneys at 1-800-TellRobert for a free initial consultation. We have over three decades of experience practicing law in South Florida, and we will evaluate your case free of charge and advise you of the necessary steps to secure your legal rights. Our phones are answered 24 hours a day, 7 days per week. 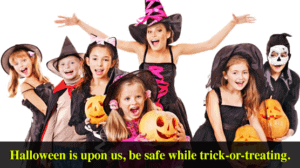 Home > General Blogs > Make Sure A Fun Halloween Is A Safe Halloween!